Villa Tesora is a spacious 3 bedroomed, 2 bathroomed air conditioned and comfortable villa furnished to a high standard. The Villa is practically situated on the Javea Golf course and only a 10 minute drive to the beaches in Javea. Therefore is a perfect location for couples or a family holiday with children. The garden is secure and secluded and is very safe for children and also wheelchair access is not a problem as the villa is all on one level. There is also a large secluded covered terrace overlooking the pool area so watching a young family is very easy and relaxing. Very enjoyable stay,villa is set in a very quiet area.The villa has a lovely pool,great outside seating areas and large rooms indoors.It has good fast internet,enough tv if you need to watch it and the kitchen has everything you need which we have found lacking in other villas. beautiful view and need to upgrade the wifi little bit slow. Villa Tesora served it's purpose for our visit, and overall it was clean & spacious. The villa was fine & location was ideal for the purpose of our visit. Whilst the villa was comfortable for us, it could do with updating, it is a little tired looking. Also feel that with a dishwasher there, tablets should be supplied. We had to remove a dead Blackbird from the windowsill of the twin bedroom on pool side, it had been there some time as it was smelling, and that's how we noticed it, so cleaner is not checking, and there were rodent droppings on sill also, we cleaned it all off and more droppings there next morning, so this needs to be looked at. I would like to say a big thank you to Tricia and Colin, on our arrival we were met by Tricia, who took us to the villa, the villa was lovely and clean, the pool crystal clear. The villa has every thing you need for a very relaxing stay. The holiday was the most relaxing time we have spent in Spain, the villa and grounds are very secure and secluded (we have 2 children) they spent many hours in the pool, it is located near lovely villages. We will certainly be going back next year. Following a 2 week stay in late June 2012, I can highly recommend this Villa to all. First and foremost, thank you to Trish and her husband for all of their help and their first class service before and during our stay. I can not praise them highly enough and would not hesitate in recommending their beautiful villa to anyone. For anyone looking to book this Villa, I travelled in a party of six which included my and 1 and 3 year old children. I can honestly say that this Villa ticks all the boxes. The villa is located in an ideal position. It offers an extremely private and quiet stay set in beautiful gardens with a wonderful pool and unspoilt views over the valley. The Villa is also completely secure so as a parent you can relax and allow your children to enjoy the lovely gardens and outside space, whilst you relax on one of the many poolside sunbeds in either the sun or shade. The accommodation at the Villa is also very good. 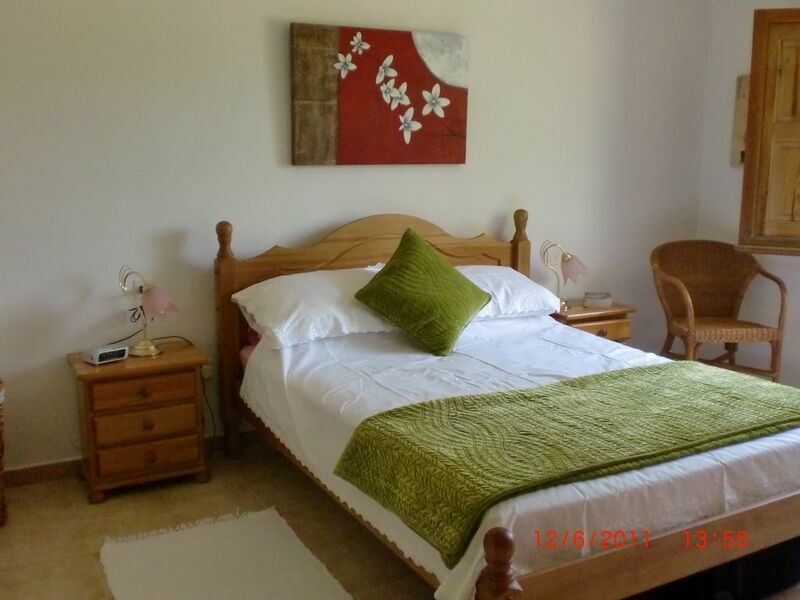 It is well furnished, comfortable and offers ample space for 6 people. The Naya is the perfect spot for taking all meals, enjoying an early afternoon siesta in the shade and safely watching your children play outside and in the pool. If anyone is like my wife and loves the sun, please be assured that this Villa catches the sun at all times during the day whilst still offering numerous places to enjoy a good book in the shade. This is truly lovely villa which I hope to return to again. This was a lovely villa in a good location. The pool area and garden are fantastic and very well looked after. Lots of places to relax with a good book in the sun or the shade of a palm tree. The house interior is comfortable and well equipped and the TV has English channels too. You definitely need a car here, but the beach, restaurants and supermarkets are only a very short drive away. Trisha, the owner was very friendly and helpful. The house would benefit from having Wifi and although the bathrooms are very clean they are a bit tired looking and would benefit from a revamp. Javea is the ideal family holiday location. The Javea area is best known for it's unspoilt beauty and blue flag beaches. Javea has three main areas, The Arenal beach (10 Mins drive) which has a beautiful sandy beach surrounded by bars and restaurants. The port area has a very interesting ambience at night with it's promenade along the sea front and bistro bars to enjoy a cocktail or two watching the moonlight glistening on the water. It also has a modern fisherman's church to visit. And July sees the Moors & Christians fiesta being held in the port area. The old town has a long history with an impressive medieval church set alongside old town houses and traditional tapas bars along the main streets. All in all Javea has it all for a good family holiday with children or a relaxing break for romantic couples. Locally you have other places of interest to visit including Denia, Gata de Gorgos, Moraira and Calpe. As well as A theme park and water park within 45 minutes drive.